We have all heard the good things about the health benefits of Apple Cider Vinegar. It is good for your hair, skin, and cleaning. We know that is it good for us but it is so hard to drink… Like other things that are good for us, it does not taste good. Bragg’s is better than most, but what if you could make your own? Now, what if I told you it tastes better, costs almost nothing to make, and is even better for you? What do you need to make Vinegar? Wine (I prefer white.) The cheaper the better! Old and funky is okay too! Vinegar is a byproduct of wine. When a wine goes bad, it turns to vinegar. More expensive wines work very had to keep their stuff from turning to vinegar, so I do not recommend them. You can save old wine, if that is a thing in your house, or you can do like I do. I buy big ol’ boxes of white wine from the store. I do not bother to chill it, and it is easy to store! Since it has a little nozzle it is easier to measure out exactly what I want and store the rest! I spend about $15 and it last months! What to feed your Vinegar? You heard your mother (or someone) say, “You are what you eat.” This is true for vinegar too! Whatever you feed it will “flavor” the vinegar. The most popular to make is Apple Cider vinegar. If that is what you are wanting to make, then feed your vinegar apples. What else can you feed vinegar? Random fruits (It is best when old but not yet bad. Strawberry tops also work) If you bought too much fruit and don’t want to waste it, start a fruit vinegar. Nothing rotted or spoiled. It is not your compost. 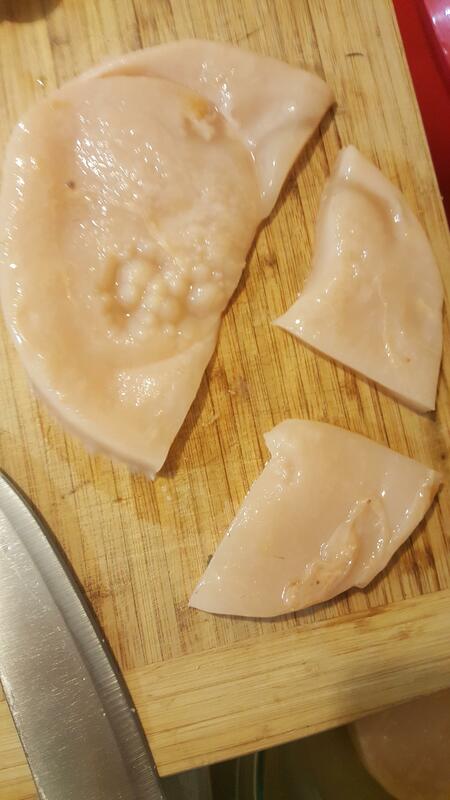 You DO NOT want mold in your vinegar at all. If at any point you see mold forming, get rid of it. The mother of vinegar looks kinda gross but it is slimy, not fuzzy. If you see fuzz, toss it! Keep in mind it is highly acidic and may not be safe to dispose of down the drain. All vinegar I have had go bad, I tossed by a tree. You will lose some vinegar, it happens. Don’t feel heart broken, learn and start over! City drinking water should be safe, at least we are told it is. It also has chemicals, and who knows what else. That may not be good for your vinegar. It could have the stuff to kill bacteria in it and your Mother of Vinegar (MOV) is pure bacteria. It is best to get distilled water, but a good filter will work too! Like I said above I use my Zero filter water. Make sure your jar is clean. I hand wash my jar with my Thieves cleaner (don’t have thieves cleaner? Contact me! ), rinse with crazy hot water and let it fully air dry before use. To prevent mold, you want to make sure anything fed to the vinegar is very clean as well! I use Thieves Fruit and Veggie Wash (contact if you need some!) and let it air dry as well. I do not fully dry, just dry enough that the plant is still green but no longer damp. This seems like the hard part, but it’s not! I stressed over this when I first started, but now I have so much MOV, I can not give it all away! If you live in the Austin area, I will give you a Mother of Vinegar! If not, let me teach you how to grow one! The easiest way to grow a MOV is by making vinegar. I know that seems circular, but it will be clear soon! When making vinegar, a new MOV grows on the top. 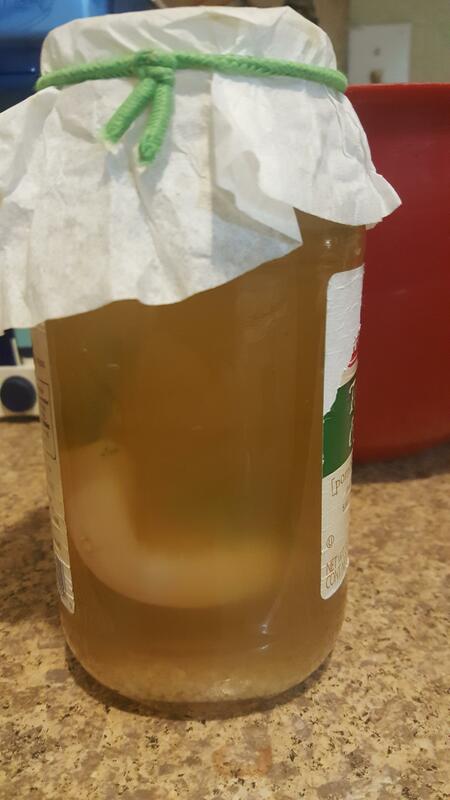 This new mother can be used in the next vinegar. I bet you are thinking, “Awesome, so how do I get started?” Easy! Raw vinegar when feed, grows a new MOV, and you can buy good raw vinegar! Just buy one bottle and that is the last bottle you ever need! (unless you are like me and kill a few mother’s because you made it harder than it needed to be! Let’s assume if you are reading this, you have NEVER made vinegar. I will even assume you do not have a MOV stashed in the back of your fridge. Clean your Jar and herbs (or whatever you are feeding your vinegar) and let them air dry. Place herbs in the jar, and fill it halfway with wine. Add at least 1 cup of Bragg’s Apple Cider Vinegar. This does not have to be exact. Since you do not have a MOV yet, I would use even more! 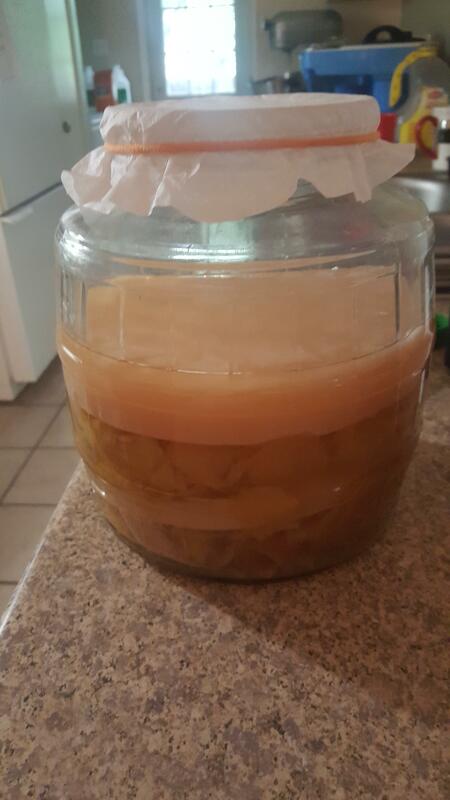 I think my first batch I did half vinegar, half wine, and no water. As my MOV gets a stronger I use less vinegar. Cover the mouth of the jar with the coffee filter, and close it off with the rubber band or a piece of string or yarn. There is something called vinegar flies that will try to get into it, so you want it sealed but still able to breathe. Apple Cider Vinegar being started! Once you are sure it is done, take a metal spoon, get a little liquid and taste it. Is it vinegar or booze? If vinegar, keep going! If Booze, let it sit longer! Now it is time to filter it. Safety note: Use gloves, and face mask! I burned myself taking these photos and it was not the first time. My husband gets on to me every time! 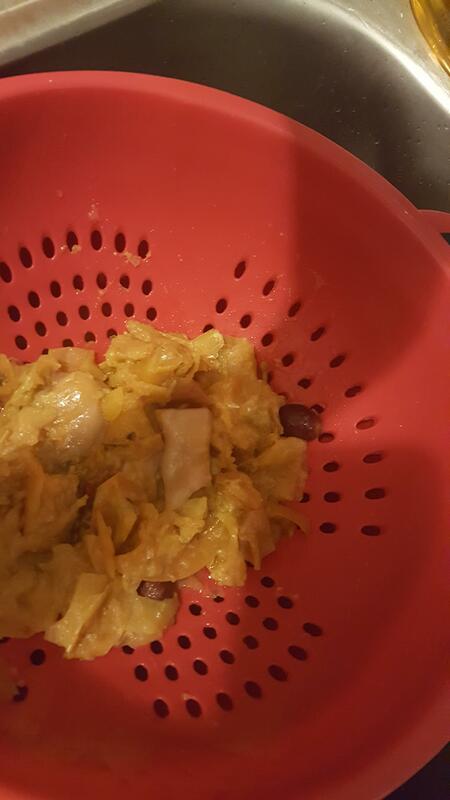 Pour the vinegar through a colander to collect the MOV and scraps. 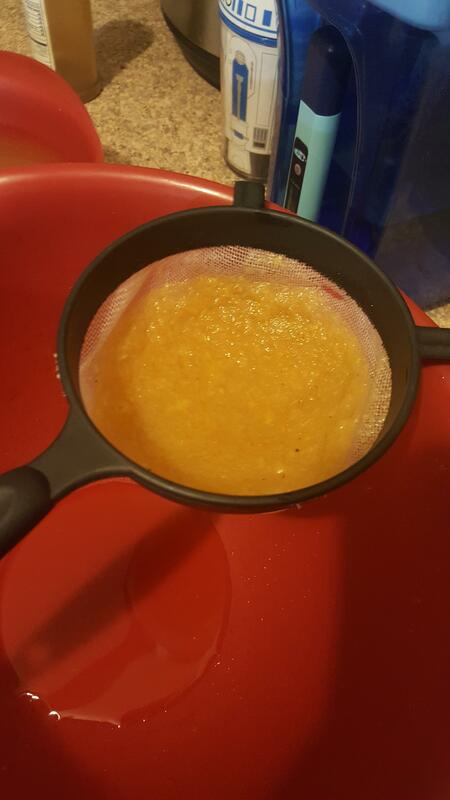 (Make sure you have a bowl under the colander so you do not lose your vinegar!) Toss the ick by tree. (I am not sure it would be wose to compost because of the acid content, but you can still let it rot somewhere.) That is apple from my ACV. Collect the MOV to use on your next batch! For real though, wear gloves. My Mother of vinegar is thick. 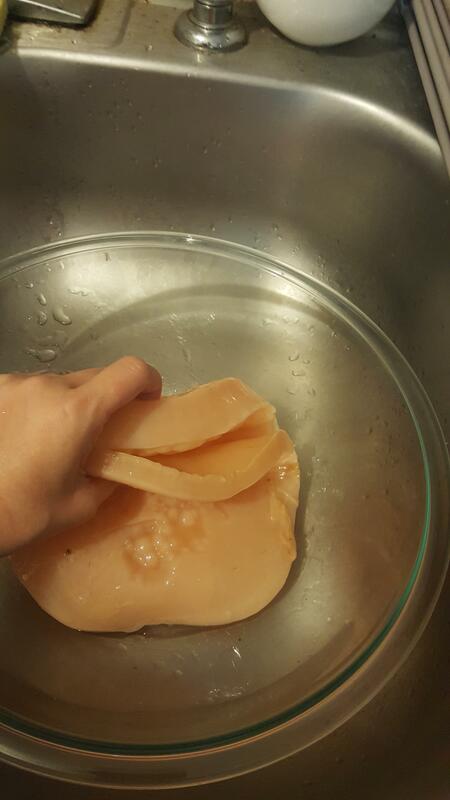 I have been making vinegar a while and not all MOV are this thick so no worries if yours is not. Filter your vinegar some. It is normal to have some “sludge” on the bottom of the bottle. You can filter with a coffee filter to reduce to sludge. I just use this to filter because I do not mind the sludge so much. It will sink to the bottom of the bottle and I use that in the next batch of vinegar. I toss the stuff in the filter. Bottle it! Drink it, cook with it, or whatever! Save some for the next batch, and refrigerate the rest! It does not have to be kept cold, but it will grow a new mother if you don’t. Since it is raw, it is full of probiotics and if you keep it around a while (even in the fridge) you may have t filter it again. Let’s say, you have at least a basic understanding of vinegar making and you want to expand now! You want to play with it! Since I made a small batch, I used about 2 Tablespoons of each herb in an old sauce jar. Since I was making a lot of vinegar at once I cut up the MOV to use in different batches. 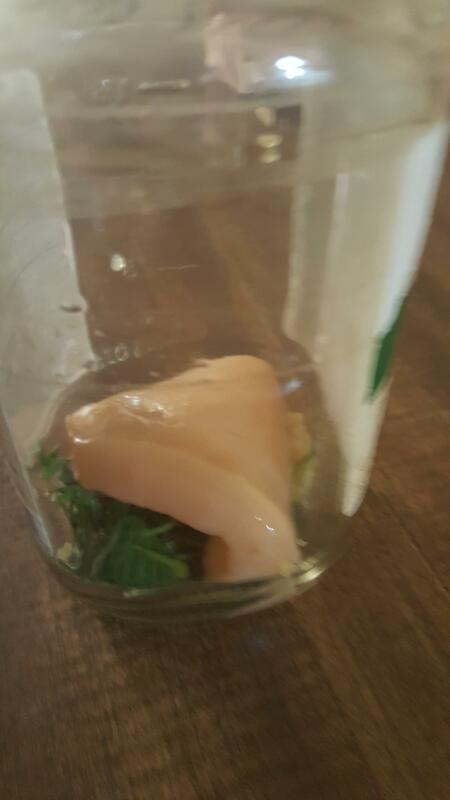 Tossed that into the jar with the herbs, and filled it halfway with white wine, and half raw vinegar. Sorry, the photos are blurry. I burned myself and it was hard to take photos after that! Mine is not yet ready but I am crazily excited to try this 4 Thieves Vinegar! What recipes are you excited to try? < Previous Build your own potato box!